What a way to start your mother’s special day with these breakfast cups in bed! 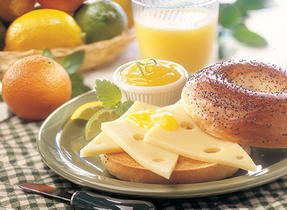 Serve them up with a fresh glass of orange juice and a bowl full of berries to enjoy a bright and cheery morning. Preheat oven to 400°F (200°C). 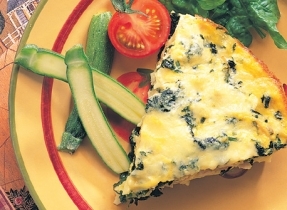 Gently push tortillas into jumbo or extra large muffin tins or 1 cup (250 mL) ramekins; set aside. In a large nonstick skillet, melt butter over medium heat and cook, onions, pepper and ham for about 3 minutes or until softened. Add eggs and using spatula, stir into pan. Add cream cheese and continue stirring for about 3 minutes or until egg is almost set. 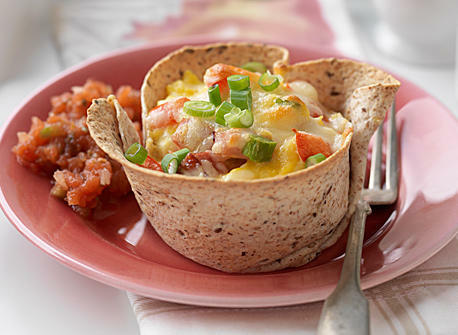 Remove from heat and spoon among tortilla cups. Sprinkle tops with Asiago cheese and bake for about 10 minutes or until tortillas are golden and cheese is bubbly. 137 people love this recipe.